At Halliday’s Pet Resort & Day Care, we think play time is very important for dogs. Your pup will get to fetch the Frisbee, run through the doggie tunnel, climb on the play ramp, and spend time with our loving staff. Yes, we said water park! Big fun running through the fresh water squirting out of the nozzles in the splashpad and running through the “rain stick” and custom made “fire hydrant” that shoots water in 4 directions! Learn more. A gourmet menu is offered 7 days a week, with flavor-of-the-month gourmet treats. …and several flavors of homemade smoothies! Choose your pet’s menu or pack a lunch for your furry friend. We’ll make sure they eat only what you request. Your pet will be served a bagel cookie and a frosty paws ice cream treat. Your pet will be taken for three 15-minutes walks outside to do their business. 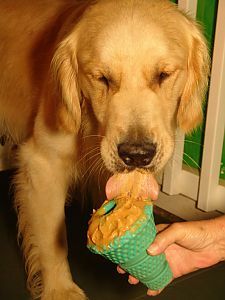 We fill a Kong toy with treats & peanut butter for your dog. He’ll spend hours playing with the Kong toy to get at the treats. Great for separation anxiety! For our boarders who need a little extra help calming down before going to sleep, we will read a bedtime story in a calm and soothing manner to relax them for a good night’s sleep. Also to help the more anxious or excitable animals, we will provide a warm and calming belly rub before dozing off into sleepy land. Combat-approved chew toys made from military parachute materials—they’re tough!